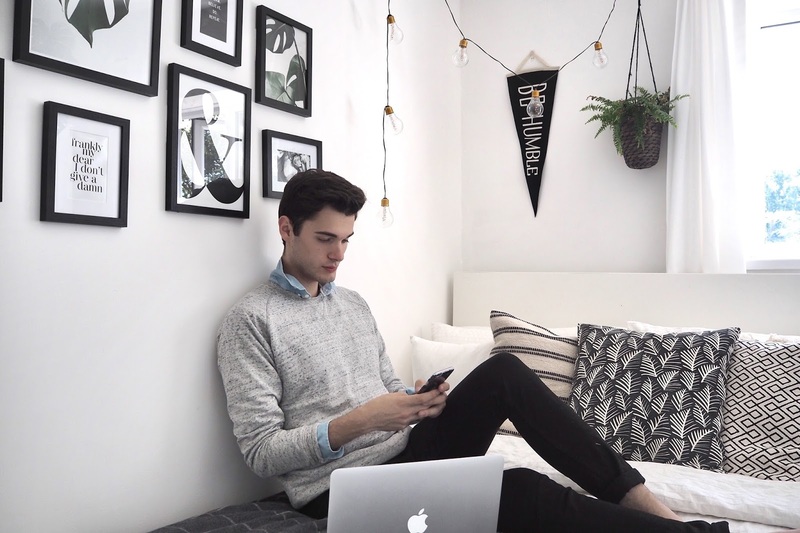 If you've been following my instagram updates over the past month, you'll know that I recently decided to give my bedroom a new look. I've always been influenced by my surroundings, so I appreciate nothing more than coming home to a great space after a long day at work. It's a place to wind down, relax and clear my head before finally getting into bed each night, and somewhere that reflects my personality. You guys seemed to really like the photo's I've uploaded and requested a post telling you where I found certain pieces - so here you go! 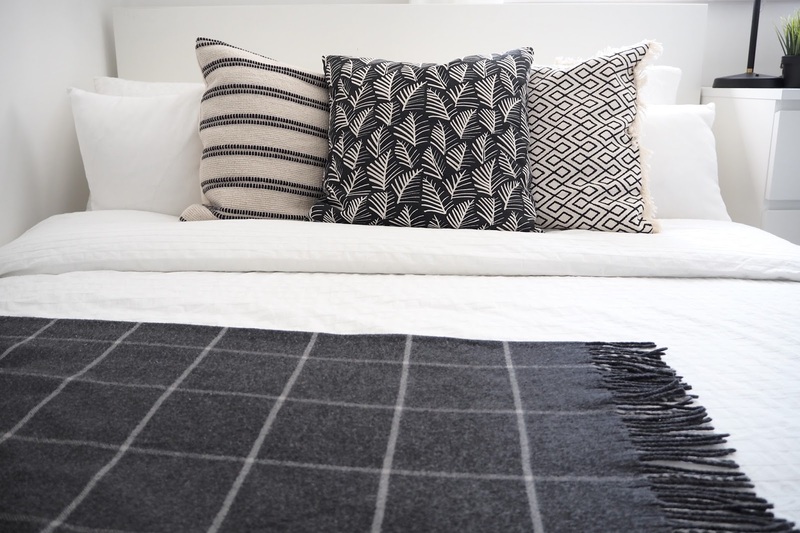 I'm all about clean, but comfortable living, with a mix of different pieces bought together to fill the space. 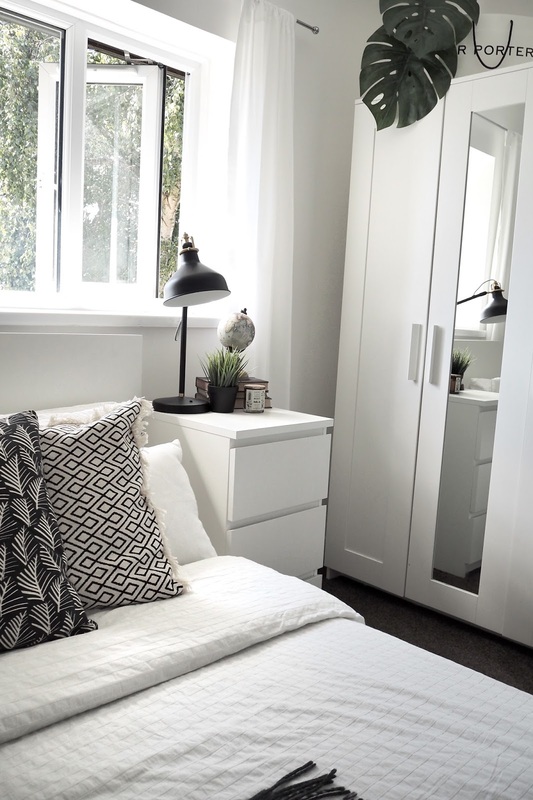 I believe in starting with a neutral base so that you can build upon this and always have the option to change any colours or styles at a later date, without having to change the whole room. 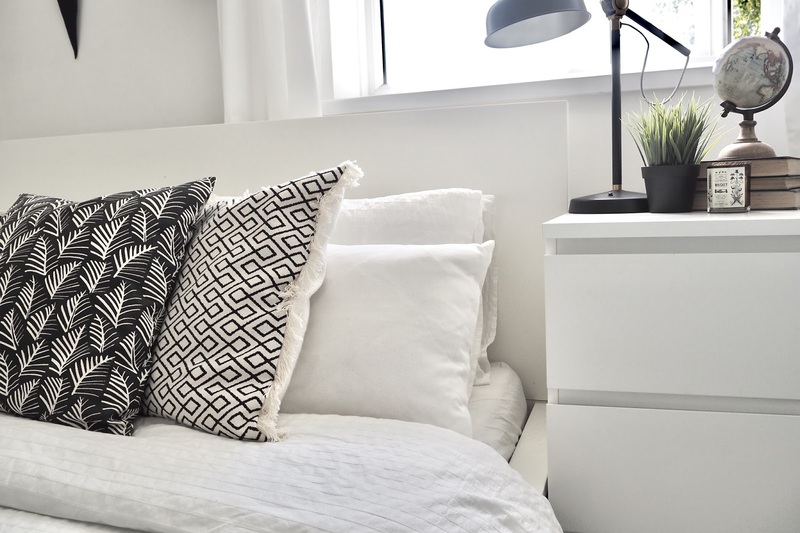 I share the house with two friends and although I have the smallest room of the three, the white walls and furniture make the space feel bigger than it is, as it doesn't break up the room by adding dark or bulky lines. Furniture Pieces (Ikea): Bed, Bedside Cabinet, Wardrobe and Chest of Drawers. Adding the details is always my favourite bit and I always start with the bed first. I'm one of those weird people that have to sleep with three pillows as I hate laying flat, so I always have a load of cushions on the bed so that it's as comfy as possible. 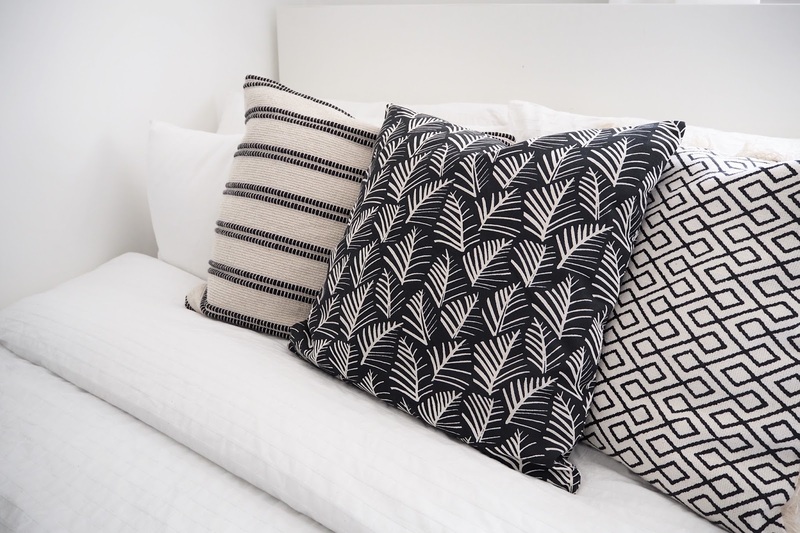 The three main throw-cushions are all from H&M and although don't match in pattern, I feel they work really well together. 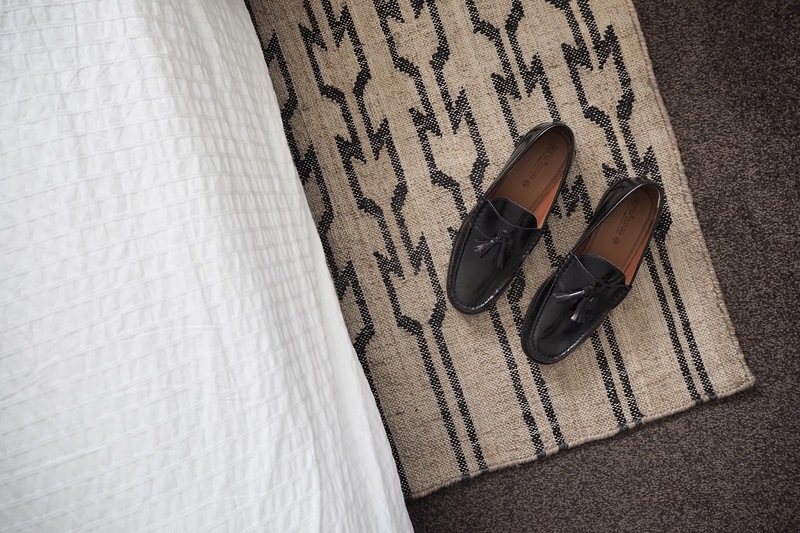 It's also nice to add different textures to the room. I also love the wire wall grid that I picked up from Urban Outfitters. 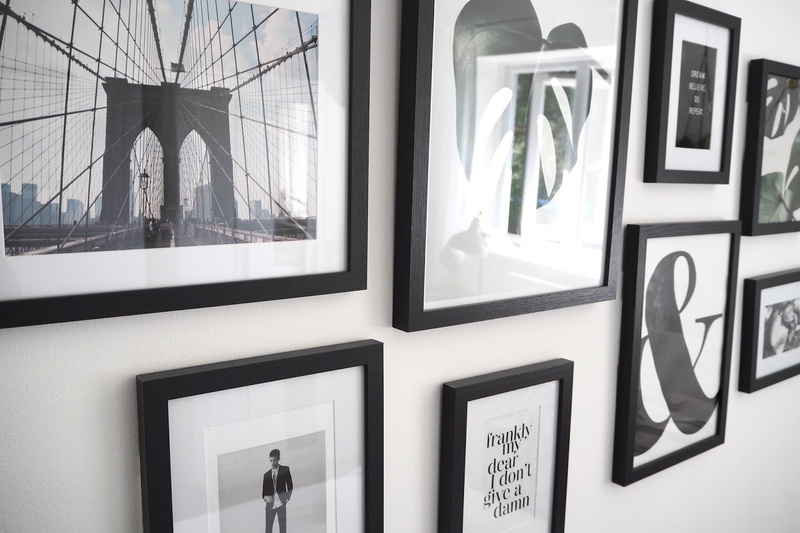 It's a great way to display smaller items and also fills blank wall space without having to opt for another photo frame or huge mirror. The thin black frame also matches the box frames I bought from Matalan to create my gallery wall. This was super easy to achieve and was attached to the wall using the command adhesive strips, to save making holes. It also means the frames can be rearranged into a different formation if I wanted to switch it around at a later date. The majority of the large framed prints are from Desenio. 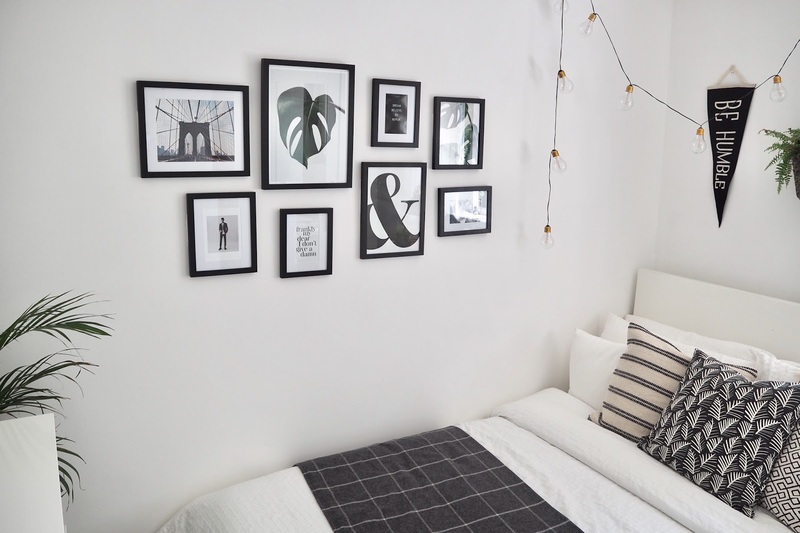 They have hundreds of graphics in a range of different sizes, so if you're interested in creating a photo wall, you should definitely check them out. 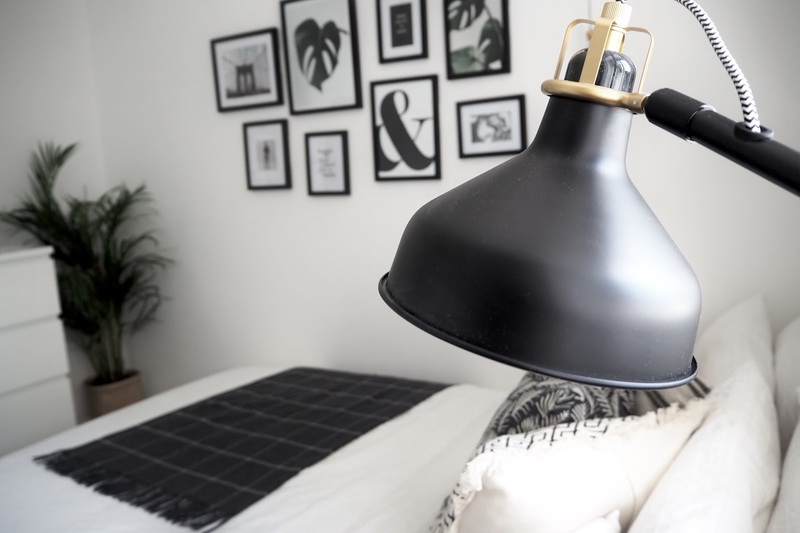 I wanted to stick to the black and white theme and love the addition of plants to any room in the house. 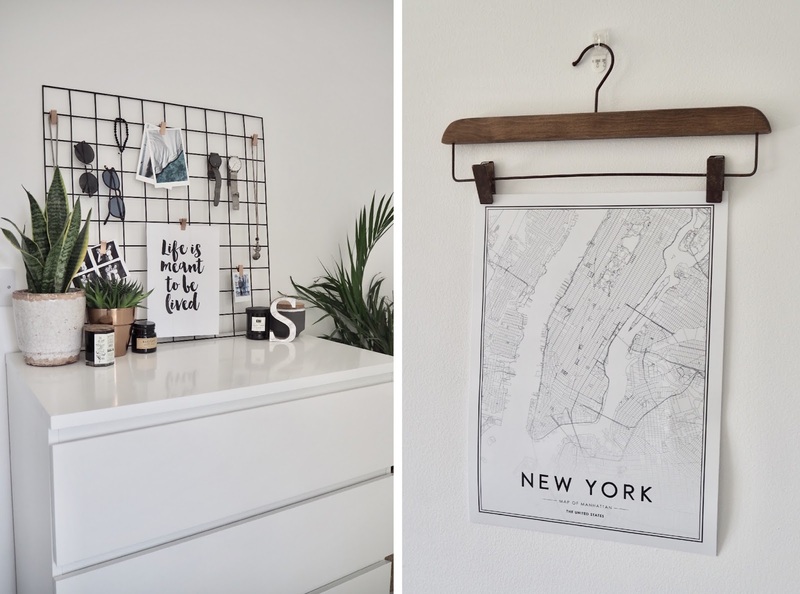 My favourite place in the world is New York, so I decided to hang this illustrated city map on an old hanger, to mix things up and to brighten one of the walls. The smaller pieces are from a range of different places. The individual plant pots are from Anthropologie - which also happens to be where I bought the rug. The mixture of ceramic and metallic pots makes it a tad more interesting, and the copper breaks up the black and white details. The candles are from both H&M and Makers of Wax Goods. At the end of the day, your home is meant to be somewhere you can unwind and relax in, and I feel I've managed to achieve this. 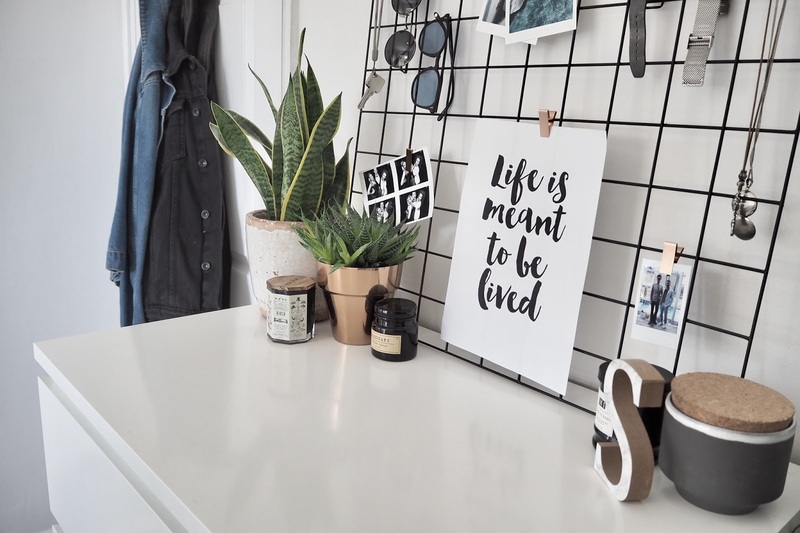 I like how minimal and bright the room is, as this allows me to unwind and keeps me feeling inspired each day. I have a few positive quotes around the room, which always help when I'm writing a post or editing photos, ready to upload. Of course, over time, I'll find other pieces to add to the space, but for now I'm more than happy with how it turned out.